There are many ways to add notes to Google Notebook: you can visit google.com/notebook or click on "My notebooks" from any Google search results page. To add excerpts from web pages, you need an extension: Google Toolbar 5 for IE or Google Notebook for Firefox. But what happens if you use a browser like Safari or if you aren't allowed to install add-ons? 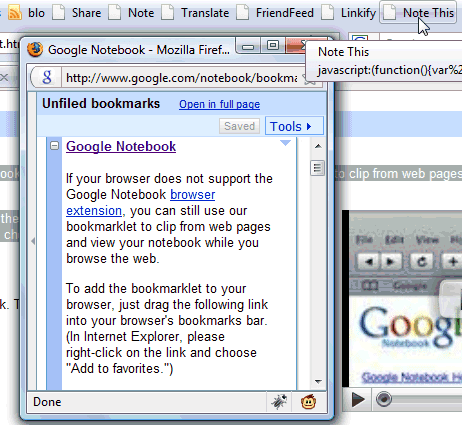 Google Notebook bookmarklet is a lightweight alternative that doesn't require installation. You just drag and drop a link to your browser's links bar or bookmark the link. To copy some content from a web page to a notebook, just select the text and click on "Note this". For some reason, Opera can only view notebooks, so this bookmarklet can't be used to add notes. Thanks for the FF addon tip. I just started using Google notebook and this should make it even easier to use. For most reasons, except the sites required IE Kernel, all things using the Firefox will be the best. +1 for annoyance at Opera read-only. Anyone know a fix? Thanks for the heads-up! This bookmarklet works better for me than the Notebook extension for FF. I found the extension clumsy to use, but the bookmarklet is great. I have saved it to Roboform2Go so that I can use it everywhere I go. The bookmarklet doesn't support Opera because Google Notebook itself doesn't work in Opera, even if you change the user-agent. From what I can tell, you can't add notes or edit the existing notes in Opera. For some reason, can't drag the bookmarklet in either Chrome 2 or Firefox 3. Thanks for the FF addon tip. I found the extension clumsy to use, but the bookmarklet is great.nice idea of sharing link, thanks, it will really be useful. Kinda funny that I came by this much later. Anyway, don't know if it was different back then but at this moment Opera (11.50) does support the bookmarklet (Google Notebook is now discontinued, though).